Back pain can affect anyone of any age, even young dancers! Can you describe what the Alexander technique is in approximately 100 words? The Alexander Technique is a systematic approach to organizing and improving one’s proprioception in order to gain more conscious control of habitual thoughts and behaviors that interfere with health, balance, well-being and performance. It is based on the discoveries of F.M. Alexander (1869-1955) regarding the use of the head and neck in relation to the trunk and its effect on overall coordination and functioning. It is usually learned with the hands-on guidance of a teacher, although its basic principles can be effectively communicated in a group setting. What is your opinion, thinking from the Alexander Technique, on the cause of low back problems with dancers? I would say that almost all low back problems are the result of faulty habits in one’s postural behavior, and that there is no fundamental difference between dancers and non-dancers in that regard. Common to most low back pain sufferers is the habit of habitually hyper extending the knees, thus causing more strain on the low back. If a dancer uses too much effort to obtain “stretched knees”, combined with too much effort to “pull up”, then the result will be a shortened, narrowed back with increased pressure on the lumbar spine, a hollow back and ribs that are pushed forward. The dancer then tries to correct all this by increasing tension throughout the abdominals and intercostals, thus adding yet more pressure and stiffness to the trunk. This tendency to do more (tighten this, hold that, strengthen this) rather than do less (stop distorting yourself) is a very strong contributing factor to low back problems. Another common source of low back pain is using the lumbar spine as a bending joint rather than using the hip joints, which are considerably lower. 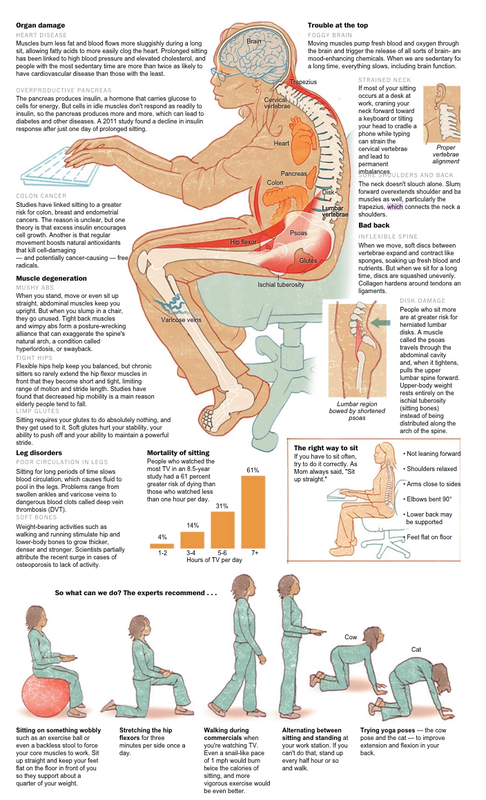 This habit results in the feeling that the legs begin at the top of the pelvis, rather than below the pelvis, and so causes excess strain on the low back in all movements involving the legs. Many dancers first get this mistaken idea from a dance teacher who tells them to “feel as if your legs begin in the middle of your back”, or similar. These types of instructions in which the teacher asks the student to “try to feel something like” are almost always anatomically incorrect and can therefore lead to rather severe distortions of healthy coordination. What can the Alexander technique generally do for dancers with low back problems? The Alexander Technique works first to release unnecessary tension in order to free the postural reflexes to a more neutral state. From this neutral state the student then learns a new and easier way to initiate movement using conscious direction rather than habit or imitation. It is in the initial undoing process that most people stop experiencing pain. How would you treat a dancer that has low back problems? I don’t treat dancers differently just because they are dancers. Nor do I treat those with back problems very differently from someone with, say, neck pain or RSI. I first work with a student to notice how they tense the neck unconsciously when initiating movement, even though that tension is not necessary and often hinders the desired movement. Changing this use of the neck in relation to the head and back is recognized in the Alexander Technique as a fundamental misuse. As the head-neck-back relationship improves, all types of problems are resolved automatically, including low back problems in most cases. If a student is in severe pain, I will focus lessons more on how to perform daily movements in an easier way. What advice would you give a dancer to prevent low back problems? Learn to stop tensing your neck so that you can stop shortening and narrowing your back so that you can stop hyper extending your knees so that you can stop pressing down. That is easier said than done, but it really is that simple. Background. Lessons in the Alexander Technique and exercise prescription proved effective for managing low back pain in primary care in a clinical trial. Objectives. To understand trial participants’ expectations and experiences of the Alexander Technique and exercise prescription. Methods. A questionnaire assessing attitudes to the intervention, based on the Theory of Planned Behaviour, was completed at baseline and 3-month follow-up by 183 people assigned to lessons in the Alexander Technique and 176 people assigned to exercise prescription. Semi-structured interviews to assess the beliefs contributing to attitudes to the intervention were carried out at baseline with14 people assigned to the lessons in the Alexander Technique and 16 to exercise prescription, and at follow-up with 15 members of the baseline sample. Results. Questionnaire responses indicated that attitudes to both interventions were positive at baseline but became more positive at follow-up only in those assigned to lessons in the Alexander Technique. Thematic analysis of the interviews suggested that at follow-up many patients who had learned the Alexander Technique felt they could manage back pain better. Whereas many obstacles to exercising were reported, few barriers to learning the Alexander Technique were described, since it ‘made sense’, could be practiced while carrying out everyday activities or relaxing, and the teachers provided personal advice and support. Conclusion. Using the Alexander Technique was viewed as effective by most patients. Acceptability may have been superior to exercise because of a convincing rationale and social support and a better perceived fit with the patient’s particular symptoms and lifestyle. I currently have three pregnant students, all at slightly different stages, so the following item captured my attention. I think this might also explain why women dancers – not to mention gymnasts – can bend backwards so much further and easier than men. Nature has a new article detailing the recent discovery that women’s spines have evolved to be more flexible and supportive than those of men to increase comfort and mobility while bearing the weight of a developing child. The adaptations can be traced back as far as Australopithecus, more than two million years ago. 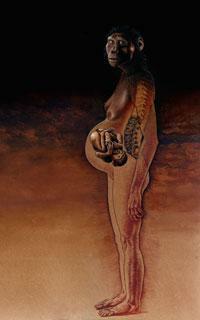 A female australopithecine, like today’s moms, used her spine to support baby’s weight. Katherine Whitcome and Daniel Lieberman from Harvard University in Cambridge, together with their colleague Liza Shapiro of the University of Texas at Austin, measured the centre of mass of 19 pregnant women and found that they leaned back by as much as 28º beyond the normal curve of the spine, they report in Nature 1. The researchers found this lowers the torque around the hip created by the baby’s weight by roughly eight times. Exaggerating the curve in the lower back can place more stress on the spine: vertebrae are more likely to slip against each other, leading to back pain or fractures. Whitcome and her colleagues found that a woman’s spine has several features that help to prevent that damage. In women, the curve in the lower back spans three vertebrae; in men, it encompasses just two. The added vertebra helps distribute the strain over a wider area. In addition, specialized joints located behind the spinal cord, called zygapophyseal joints, are 14% larger relative to vertebrae size in women than in men, suggesting that the joints are well adapted to resist the higher force. The joints are also oriented at a slightly different angle in women, allowing them to better brace the vertebrae against slipping.